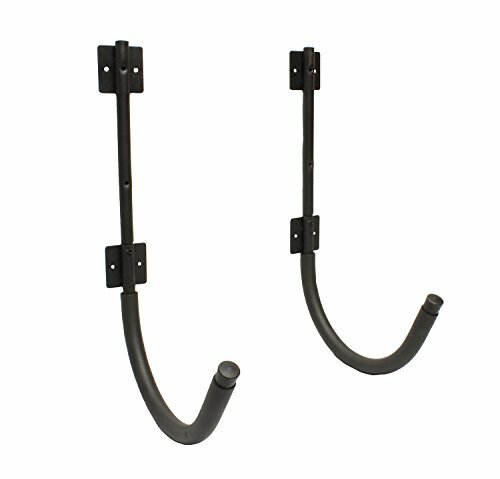 Your quick and easy solution for storing your kayak off the ground from rough cement floors or sandy porches is the Redneck Convent Steel Storage Wall Hanger Hook Rack Shelf 2-Pack (Pair) - Kayak, Canoe, SUP Paddleboard Outdoor or Indoor Garage Mount. It holds a kayak or small canoe with a 13-inch or less deck height and can handle any length. Both hooks have 13-inch gaps to hold a kayak, canoe, paddleboard (SUP), snowboard, wakeboard, surfing board, or even ladder. It has a 100-pound weight capacity and is constructed from powder-coated steel with foam padding, so it can be indoors or outdoors and will not cause bows in your kayak. This package includes a pair (2) of hangers, installation hardware, and instructions for a quick and simple mounting experience. If you have any questions about this product by Redneck Convent, contact us by completing and submitting the form below. If you are looking for a specif part number, please include it with your message.